1. Your neighbors recognize you in your pajamas, rubber clogs and a cup of coffee. 2. You grab other people’s banana peels, coffee grinds, apple cores, etc. for your compost pile. 3. You have to wash your hair to get your fingernails clean. 4. All your neighbors come and ask you questions. 5. You know the temperature of your compost every day. 6. You buy a bigger truck so that you can haul more mulch. 7. You enjoy crushing Japanese beetles because you like the sound that it makes. 8. Your boss makes “taking care of the office plants” an official part of your job description. 9. Everything you touch turns to “fertilizer”. 10. Your non-gardening spouse becomes conversant in botanical names. 11. You find yourself feeling leaves, flowers and trunks of trees wherever you go, even at funerals. 12. You dumpster-dive for discarded bulbs after commercial landscapers remove them to plant annuals. 13. You plan vacation trips around the locations of botanical gardens, arboreta, historic gardens, etc. 14. You sneak home a 7 foot Japanese Maple and wonder if your spouse will notice. 15. When considering your budget, plants are more important than groceries. 16. You always carry a shovel, bottled water and a plastic bag in your trunk as emergency tools. 17. You appreciate your Master Gardener badge more than your jewelry. 18. You talk “dirt” at baseball practice. 19. You spend more time chopping your kitchen greens for the compost pile than for cooking. 20. You like the smell of horse manure better than Estee Lauder. 21. You rejoice in rain…even after 10 straight days of it. 22. You have pride in how bad your hands look. 23. You have a decorative compost container on your kitchen counter. 24. You can give away plants easily, but compost is another thing. 25. Soil test results actually mean something. 26. You understand what IPM means and are happy about it. 27. You’d rather go to a nursery to shop than a clothes store. 28. You know that Sevin is not a number. 29. You take every single person who enters your house on a “garden tour”. 30. You look at your child’s sandbox and see a raised bed. 31. You ask for tools for Christmas, Mother/Father’s day, your Birthday and any other occasion you can think of. 32. You can’t bear to thin seedlings and throw them away. 33. You scold total strangers who don’t take care of their potted plants. 34. You know how many bags of fertilizer/potting soil,/mulch your car will hold. 35. You drive around the neighborhood hoping to score extra bags of leaves for your compost pile. 36. Your preferred reading matter is seed catalogs. -Author Unknown, I’d love to give credit to the rightful author. Wanted: People who would like to grow small plants at home. with your bibs on. Click here. You keep “pill” or “craft” zip bags in all your purses and pockets – in case you pass an interesting plant in seed. You bought your hubby a urinal to fight the deer +/or jump start the compost. You’ve got 18 ft of grow-light shelves and every windowsill in the house full . . . and its 6 weeks yet to LAF! Oh, and daughter adds – – you prune/shape over-grown shrubs on neglected graves of strangers when tending your own family’s plots. I am tooo busy to read this …….I have more plants to bed in! Why do you laugh at perfectly normal behavior? I shared your list with a friend and I am sure she will be following you soon, too. Hilarious. I am in a decision mode.. Does my back yard, one of the only fairly flat ones in the neighborhood, remain grassed for my boys’ soccer, or does it become gardened throughout? Plants don’t do well when soccer balls land on them! But the love of gardening sure compels us. I start hassling the guys who work for the village in June, to dump the leaves they pick up at my place. Otherwise when October comes along they’ll forget and take them to the dump. Wow such great info need to keep this blog alive! You carry disposable dropcloths and tarps in the trunk of your towncar just in case you need to haul something. You know exactly how many bags of metromix you can get in your trunk if you put the spare in the back seat. You CAN get a 7′ tall potted tree in your car. There are three ‘mow for pay’ businesses in town and they all have your permission to put straight grass clippings and all maple leaves they can find in your compost pile–and they do. You had a pet praying mantis in your greenhouse enclosure (former laundry room rigged with T5 lights) and it survived the winter. You made a deal with every restaurant in town and go around weekly to collect pails of coffeegrounds for your compost. You drive a 30 year old pickup that’s mostly all the same color and everyone in town knows it, but you also have the only pickup that can have ANYTHING hauled in it, and you do. The nursery center owner asked YOU how to get pampas grass to grow and you let them know that white and pink aren’t in the same growzone… You can catch a full grown black widow spider In a baby food jar(mostly to give the extension agent a heart attack, yes it’s still alive). You fear no one brandishing a garden hose with a spray nozzle, you are used to taking rainbirds in the face at 100f while adjusting patterns. You have ever slept in a temporary hoop enclosure outside with a prized plant because the power was out and you don’t have a generator so you use body heat and share a blanket. And best. Mike can talk dirt-y in his videos and it’s favorite viewing! Thanks Deb! And true gardener, who has been gardening a long time comes to a point when they realize they can no longer out run a rotating lawn sprinkler. The hard way! At 100f, do you WANT to outrun the sprinkler? My better half can’t understand at 104f it took me an hour to ‘adjust the patterns’ and I come in dripping wet from hairpart to toenails. Just because you get older doesn’t mean playing in the sprinklers is out of bounds. Your friends and neighbors give you plants in the fall as long as you give them a cutting back in the spring (happily rooted and going good). And you have room to winter them. You keep goldfish and koi in ponds so you have all that lovely ‘used’ water for watering with. You’re on a first name basis with several arboretums and they are used to you looking for weird and strange trees, shrubs, and bushes. You take Mike’s advice and buy a pair of Corona’s. Those are the best darn nipper clippers and totally worth the buckage. Spouse is awed, I bring those in with me and they have a place of honor INSIDE the house. I add a small pair of flush nipper cutters ($5-10 look in the bead/craft area and make sure they close flat and flush) for dethorning and debudding, and that perfect for collecting/processing/trimming hardwood and softwood cuttings! You have ever used the gardenhose on yourself and what you’re still wearing so you can go in the house far enough to get out of all that and dump it in the washer. You can use your car remote to lock your car faster than the fellow with half a pickup load of zucchini needing a home can get to your car…. then you sneak about half a bushel of cucumbers in his pickup box when he isn’t looking. …when you sit and read every last gardener’s comment (from five years ago no less) on a great post to prolong the connection to like minded souls! Yep, you got me! Ok, so I just wonder who has been watch in’ me to know all that! Haha, ain’t it the truth! Numer 38. When you see a wilty garden you think PMS. Paucity of Moisture Syndrome. I might frame this list. 38th way should be: “Mike McGroarty is your BFF” Thanks Mike! Fanatic? years ago my friend lived up north to go to school and lived in an apartment at a private home. We brought a few seeds from our southern garden and secretly planted them in the yard. her land lady was so curious about the corn and watermelon plants we all had a good laugh, but our friend was OK now in her new home. You folks who are getting manure will have a whole new cop of weeds. It doesn’t matter how old it is, if it’s not sterilized the weed seeds will survive. The only unprocessed manure you should use is the “formed” kind as in sheep or goat. Their digestion is different, you never see a seed or kernel in that manure like you do with horses or cattle. Mike – I love your forum/website and I have given a few friends your address to subscribe to. Even entered a few of their addresses for them in case they forget. Yes I see that I am also a garden addict and can relate to just about all of the symtoms – isn’t it wonderful. Also a confirmed rock hound. My partner is known as the “Rock Whisperer”. There are worse names to be known by. I enjoy reading all the posts….. I don;t feel bad now when people look at me funny when I tell them in the store when they are looking at plants how much water and light they need…lol I belong to Mikes back yard garden board and it is one of the best things I have ever done !! I have learned sooooo much from Mike and the other members. The plants we buy and sale to each other are fabulous also. Such great and funny phrases! I am a beginner,but most of them describe me. or even some ready compost (from horses) 1 1/2 years old! one lady is giving me as much as I need for my new garden beds! MIKE THANK YOU SO MUCH for everything I can read on your website about plants.I’m learning a lot and planning to buy your kit. I thought I was the only one who pulled up weeds. Now I feel better about pulling more of them. Thanks for all the great ideas from everyone. I AM SO HAPPY I AM NOT THE ONLY ONE CRAZY ABOUT GARDENING, I HAVE MANY OF THIS SYNTOMS AS MANY OF YOU MENTIONED. FIRST THING IN THE MORNING, WITH A CUP OF TEE, TRYING TO WAKE UP WALKING THROUGH MY GARDEN, PICKING UP WEEDS, TALKING TO MY DOG AND THE PLANTS, FLOWERS, PRESSING MY FINGERS INTO THE FLOWER POTS TO SEE IF THEY NEED A DRINK, ANYWAY I TAKE THE HOSE AND GIVE SOME WATER TO MY FLOWERS, TREES, CLEAN THE PATHWAY, I HATE TO GO BACK INSIDE, I COULD SPEND ALL DAY OUTSIDE LOOKING FOR SOMETHING TO DO IN THE GARDEN. I could tell so many stories are happening in my backyard. I love all your comments. I LOVE YOU FELLOW GARDENERS, AND GOOD BLESS US ALL. I originally posted this on my blog. Some lines I found scattered around cyberspace and some are original. My husband wrote a sequel on being married to a gardening addict. OK with you if I quote you? You know you’re addicted to gardening when . . . . Went to talk to friend who had flowerbed in front of her business, and she had just started, and someone interrupted her for business. I bent over and robo-weeder took over. She finished the call and found me at the other end, the sidewalk with a trail of weeds. We swept up and went in to talk…. Yep, I know how it is, see weed, weed is no more. some of these fit me to a t. Back in1981 i picked up just over 2000 bags of leaves. I covered the garden nearly a foot deep. Bad idea. The ground took forever to dry out to work up, especialy here along lake erie. I watched a program, Making It Grow. I watcht it on RFD.TV. It is a gardening show produce by South Carolina Ext. Service. They were interview a propagation business. One thing they were doing was adding carbon dioxide into there propagation boxes. I wonder how I could add it to my tank? Charles, my motto is to keep it simple. 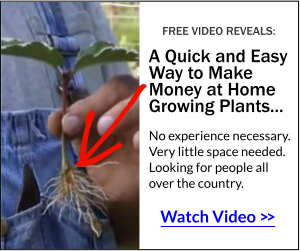 Trust me, you can root tens of thousands of cuttings without adding carbon dioxide. Most nurseries and almost all of our Backyard Growers root their cuttings outside in the open air with incredible results. I already know I’m addicted, but you know when someone thinks you’re addicted when you offer them compost tea and they think you’re offering them a nice cool drink. Mike, I’ve been receiving you e-mails for at least a couple of years now and always appreciate the tips you give. Thanks. Thank you for sticking with me. I try and make it useful. Shirley, anytime you move a plant during the growing system it will be stressed and you will see plenty of evidence of that. Most things really need to be moved while they are dormant. However, hosta are pretty tough and yours should be fine. Just keep them watered and shaded as much as possible for now. They should come back strong. Mike, Rather than making snide comments, how about some Real Talk. My Japanese Maples are showing stress from being outside. Instructions say morning sun only. How would you provide shade for a tree, or is it necessary? I am in South Georgia with 90 plus temps, Help!!! Carey, you don’t say how tall the tree is. If it’s rather short then I would make an attempt to give it some shade for the first summer for sure. If it’s a larger tree there’s really not much you can or need to do. Keep it watered but not soaking wet. Don’t fertilize it and don’t wet the leaves when you water. Water droplets on the leaves during hot sun will also burn the leaves. Mike, I find myself described above…….wow!!! I’m getting there but the hot sun, hard work, all;ergy to weed killers aand wild varmints just might help me break the habit. However, it keeps me out of the pool hall. What lovely people you all are! Thanks, Mike, for bringing us all together from all over the world! I am sure I qualify as a gardening addict; my daughter announced the other day that everyone always knows what kind of present to get for me, no matter what the occasion~a gift card for Lowe’s! You might be a gardenin’ addict when you want pavers for your birthday so you can make a little round patio under the crepe myrtles and a sidewalk. what an awesome story… it’s like someones watching me lol…most of them anyway. There’s nothing wrong with wanting the world to be a beautiful place. Thanks again! yep….i nick seaweed and cobble stones from the beach here in ireland…sssshhhh!!! as for the hair and nails thing…when you start gardening in the morning, dig your nails into a bar of soap so theres no room for dirt to get in! Mike, that was so funny about being addicted to gardening. At first I thought you was the master mind on it. Thanks for sharing. I enjoy your web site. I had to chuckle and give him a hug. Oh, the wonderful wisdom of children! you know you are a gardener when your boss at work is picking twigs out of your hair and saying “I know what you were doing before you came to work” I don’t have to be there til 9:30 so have plenty of time before going to weed or whatever and I keep alot of stuff under this burning bush. right now it has little buds coming off and I wear them to work. Also if after it rains you pick up worms out of puddles and put in your compost.You have to save them, ya know. poor things.And they thank you by making better soil. one hand washes the other. even if they don’t look it. I really enjoy your news letters and videos, keep up the good work. Have a nice evening, I have to go wash my hair, to clean my nails & to get the rest of the buds out. Donna, I don’t think he minded doing the digging, but probably wasn’t crazy about being on video. But I’ll let him know that he has to put on his camera face! So what is wrong with being special to your garden, I found not one of the notations to be out of place. My wife tells me the exact same thing about me and I just tell her that that is how I am. Gardening is in my blood as in yours. So what if your neighbor finds you a bit excessive in some matters when it comes to your garden. In the long run, who’s garden looks to be a trophy winner this summer? Well my guess will be the one who washes the dirt off his hair to have clean fingernails. That’s who. So continue being yourself and be happy knowing that you are helping the ego system stay green in your neck of the wood. Thanks for sharing this with us. Fernando, you are absolutely right. On more than one occasion I have been considered to be completely off my rocker when I moved into new homes and completely ripped out the landscape and cut down trees. A few years later all of those people admitted that they doubted what I was doing, but they now realize that I had a plan. Recently somebody on the Backyard Growers Board pointed out that “they can’t see my dreams”, so they have no idea where I’m headed. I love that; “they can’t see my dreams”. I learned some new tips such as “dumpster diving” for bulbs…what a fabulous idea. I, too, pull weeds wherever I am. You take pride in old gardening scars, and shamelessly greet your neighbors with mixed sweat and soil streaks covering your clothes, legs, arms and face. You count earthworms and red worms among your inner circle of friends. I love this blog…ihave learned so much from ‘listening’….being a beginner (an old one) i have a lot to learn…Mike, so glad you took it all to the computor to share!!! Connie, thank you, that’s always nice to hear. P.S. I didn’t know what “IPM” meant, so I googled it. I found “Integrated Pest Management”. If there is another meaning for “IPM”, I’m ALWAYS happy to learn more! I saw myself in most of the above, and LOVED ’em all, including all the wonderful comments! It’s a comfort to know I’m not alone. No one else in my family is interested in gardening, but they admire the results. I had thrown a squash and a zucchini in the compost bin this past winter and found lots of seedlings this spring… took them to work and gave them to some of the ladies I work with… I have blossoms setting right now, can’t wait to find out what I really have. Hey everybody. I’m glad you liked this fun little post! I can possibly respond to all of the comments, but that you for your contributions. Share it with your friends, they’ll enjoy it as well. I only answered “yes” to 10 … but I LOVE gardening. Guess I’m still in training! Mike, thanks for the list, I have shared it with many and as a reward I’m sending a photo of my gardens “Fairy Princess” and also one of her helpers, a “Large Face” Elf. You people are sooo sick! I’m glad to have company! EVERY TIME I GO TO LOWES, I BRING HOME “RESCUE PLANTS” MY WIFE THINKS I’M NUTTS. OUR NEIGBORS TELLS US, WE HAVE THE BEST LOOKING HOUSE ON THE BLOCK. Our house is encircled by huge oak trees and last year yielded a bumper crop of acorns. We hauled out nearly 30 bags of acorns. Those that didn’t go have created a gazillion oak sprouts. Some are nearly a foot tall already. I weed the sprouts and I wish I could sell them. Not sure about the first part of my text reply I didn’t type?? awaiting moderation..??? sounds like I am being vetted first. A okay with me first time I have ever posted on any online venue. too busy in the garden is my guess scooping up acorns for my pigs…. Our first time my husband’s grown kids had us to dinner-I bagged up the shrimp shells! They thought I was nuts. Now they ask what scraps I want to take home with me. Composting is an obsession. …you live in a state that it snows, and you get depressed October thru March. I love it! Add to the list : buying new plants you love, before you have a place to put them. I do it every spring. how true is that Mike – you’re awesome. I’ll pass it on. When you use the doggie “dew’ and leavings from the partner’s fishing to fertilize your flowers, you beg your co-workers for some of their plants ( and give them some of yours that have gotten “too much”), trying to figure out how to collect rainwater in a tight space, spreading a sheet to collect some of the elderberries from your tree that has grown into the unfriendly neighbor’s yard so you can’t pick them, your social work clients give you plants they cannot use, and you try to think of ways you can plant more plants, trees, fruit, and vegetables in your city lot. Maybe I’ll just terrace the sidewalk! Thanks everyone for a good laugh at myself. I have a question: have you ever heard of driving a copper nail into a cottonwood tree to stop it from sending out all that fuzz every year? I really need to know because if it is true I am going to buy a keg of copper nails and go up and down the creek and “fix” all those trees that trigger my asthma every year, never mind the mess. Hazel, I doubt that it’s true. The copper is not good for the trees, but I don’t think it will give you the effect you want. And it could get you in trouble if it’s not on your property. I know a builder who has no hair, so he washes dishes by hand to get his nails clean. The ladies who don’t wash their long hair everyday, can do the same, as I do, too. Back in 1995 when I was picking an e-mail name, my grandson suggested “plantlady” that I continue to use. I had to go all the way to no. 38, so there area lot of us plantladies out there. I know I’m addicted to gardening when I don’t let rain stop me. I’m out there with lightweight rain gear and keep going. My mother always raised veggies and I stayed with the landscaping plants and flowers. She said ” You can’t eat flowers” There are a few that are edible but I never tried it. But one can surely sell a great many, which I do. I sold potted daffodils and tulips in March and April ; potted amaryllis lilies in May, Now, the potted crinum lilies are ready to blook and sell. July sunburned beach goers will surely buy my aloe vera plants; and I have a whole backyard of palm tree seedlings – three varieties.- ready to pot . I load my mini van, drive a mile down to an empty corner lot on the Hiway, and join a few other entrpreneurs. Now, at age 90, I’ll probably keep going till 100. Every day I thank God for His blessings. Helen, you’re like me. I’ve never grown a vegetable. I always helped my dad with his garden as a kid, but my passion was landscape plants. very very funny, 99% i did it, my husband jealous of me because he think I love plants more than him, my children don’t like to go to store with me because I always stop at Home Depot and Lowes’ I rather not having vacation if I have away from my garden. Subject: RE: You know you are addicted to gardening when . . .
Mike, That was great fun. I answered yes to most of them. Thanks for the laugh. My daughter and her husband recently bought a house and my daughter asked me if I would fix up her yard like I have mine. I also beg my neighbors for their leaves. I have a ton of weeds now that need removing but, a memory: When the other college girls were getting their baby oil tans I was weeding the flower beds outside the dorm. Hahahaha! This is great. I think I will copy it off and hand it to people who don’t understand the urge to garden or to be around plants. Thanks for posting it. I know many trees and plants in my neighborhood personally. I have no vehicle, no money to spend on plants, I now garden on my back porch and in the apartment, currently have two “flowerng maples,” dill, one tomato plant, two eggplants, four celery, mint, one Mexican sage (which I will propagate for gifts, I used to do that with violets but this is a very nice easy plant). My condo gardner respects none of what I established in the front yard for many years, but there are plants that still come up that I planted (bulbs, dunes violets and buttercups, ground cover, rue and an apple bush that I turned into a tree, among others.) I would like to get a few of the plants you sell, but I have no credit card. I would really like one maple tree. I am 77 and very happy. This is not a complaint. Count your blessings! At 87 I am trying to downsize, but things just continue to grow, produce cuttings, seeds, mature leaves(begonias and African violets) and appreciate water and conversation. Good stuff Mike, read it someplace before, but, can’t remember where. Stuff like this is what “normal” people need to see so they’ll understand (and maybe forgive) folks like us a little more. What Is Normal, anyway ? I would add that you know you’re a gardening addict when you’re more concerned with keeping your .22 rifle operational than your deer gun. I’m sure that you know what I’m talking about and why. Keep up the good work, and keep smiling, it makes people wonder what you’re up to when they’re not looking. You weed in the rain. You plant & transplant at night with flashlights & a porch light. You call it a day at 1 am. You use your camera phone to take pics of everyone’s flowers. You point out the names of weeds to your husband at the interstate rest area. I don’t golf, my husband does. He asks me to go golfing with him and I gladly go because there are flower beds throughout the golfcourse… I’m getting seeds, seed pods, cuttings ( yes I have my nippers with me ), deadheading and all that jazz. He comes home happy to have gone golfing and I come with, ( sometimes don’t already have the particular flower or plant ) well, a new project. He does’nt complain about it anymore he just knows it’s GONNA happen…..lol…….. When you go to the store to stock the pantry, you see the plants in the parking lot and your children say ” OH MOM NOOOOO !!! “. lol I go to the store alone alot these days. Thanks for the laugh, it started my day out right. I loved this email and I said yes to almost every single item. My husband thinks I buy way too many plants but he loves the beauty they bring also. I carry a pair of plant snipes in my car so that I can always take a cutting if needed. In response to all the comments concerning roadside / off-road assistance, I too provide plants with roadside assistance. Assistance in moving to my garden! Just the other day, my neighbor asked me, “What kind of plant is that?” I replied, most people would call that a weed, but I call it beautiful! Afterall, what is a weed? Nothing but a misunderstood unappreciated plant. BTW, the plant was chicory which looks amazing among the orange oriental poppies. Quite a contrast! And the poppies help keep the rabbits from eating my chicory! Hey, I’m not too far gone, I only scored 90%. Like your page a lot! Be careful of the weeds you pull. One person’s weed is another person’s native landscape. I am the same, I cannot stand weed even when I am walking I pull them out from people’s garden. When we purchased our new home, I collected rocks and hid them (so I thought) in the woods behind our home to use in the garden once we moved in and began landscaping. Some of the rocks were large enough to flatten but not blow the tires on the hand truck. When I heard that the landscapers had finsished their pathetic landscaping, I went over to check it out and decide where to put the rocks. What rocks? They were gone! I asked hubby where they went; I wanted them for the garden. He said, “Oh, there in the garden. The garden at the entrance to our development!! !” Those little landscaping buggers STOLE MY ROCKS! I get the message sweetie! (Don’t worry I will find more!) Hee hee! Enjoy your newsletter very very much and the great, to-the-point, how-to videos, too! Thanks Mike, great post I forwared it to all my plant and garding friends so they can enjoy your site also. Keep up the great work.God bless. Adding one to the list – you’re addicted to gardening when customers at the garden centers, Lowes and Home Depot ask you for advice and not the nice ladies with clean hands and wearing aprons with the company name on them. And another – you know what guerilla gardening is and how to make seed bombs. I’m a garden addict but isn’t it grand! LOVE that and saw myself in many things, esp “must wash hair to get fingernails clean”, lol! We went for a camping weekend recently and I was pulling mullein out of the campsite 😀 I haul home several HUNDRED garbage bags of leaves and pine needles every fall for mulch and compost… every spring I compost a gigantic pile of the winter’s bedding pack from chickens and horses (2 tons of straw added all winter plus all the manure from 20 tons of hay). I haven’t heard anyone mention rocks. As a rock hound and a gardening addict, I love to combine my obsessions. I bring home tons of rocks from my vacations with the excuse that I need them for my gardens! ROCKS???? Oh yeah, got lots of them! Mostly local, good sized, like around 300 pounds! Also have a lot of thick heavy flagstone brought in from Arkansas. Preparing to set some into a 6 foot wide by 80 foot long walkway from the existing stone path along the back of the house out to the gazebo. Then have to dig out the remaining 3 foot by about 120 foot paths that were around the rental house to move over for another path to the gazebo. Oh yeah, got rid of the old rental house so I could add another garden! This was great………I enjoyed reading all the posts…..and the story was the best………very well thought out……..All this is so interesting………I only have a small garden, but we are moving to have more area to…………………………..plant……. Thank you Mike……….you are appreciated………. great e-mail…I am accountable to almost every point. I have been successful at talking to my plants and garden so far without anyone hearing me, so they won’t send me to the funny farm, which would be okay with me as long as I had a garden !! I get a kick out of some of the women I work with. They come in and gloat about how hard they worked in their yard last night. I look at their hands and say to myself,”Not with that $70 nail job”. Me? I am a manicurist’s nightmare! Also, they tell me that my excercise program of gardening is futile and that I can’t possibly loose weight and bulk up JUST working in the garden. I invite them over to work with me and then tell me I can’t loose weight. I’ve yet to have a taker on that invite! Wheelbarrow for bagged mulch? Unheard of. Sling that bag over your shoulder and let’s go. Plants are dying. Can they spell rototiller? BTW, ladies, Troy Bilt is not the high school stud muffin! Noticing good dirt when driving around town. old lady but fairly new to gardening. Using ideas I heard over the years from even older people, I, too compost and hate to waste anything. Read the other day that when you use eggs, save the shells in water and then water your ferns with them. I had a particular fern of my daughters and have been nursing it back to health, and using that theory, and it is doing very well. Gardening sometimes is like conjuring off warts off my grandchildrens hands and feet, all these old remedies work, but they see me as riding around the skies on my broom. I told them only on halloween, with my chin covered with the warts I buy. hehehe. Your garden and yards look lovely, and are an inspiration to everyone, Mike. Can’t get any closer to our Lord than this, can you. Just picked my first egg plant and a few tomatoes, but think the soil where I am, (we live near a bayou in Pensacola, FL ) is really not what it should be, so will have to work on it this winter. Enjoy your column. Add – you want to mow, clip, and plant the roadside along every road you’re traveling. this was super, halarious, I certainly did identify with so much that was written. My next mission 2 rain barrels,(free ones!!) This for me would be the most wonderful thing for my gardens that I love so much !! I’ve started mailing disks of my garden to people who DON’T come to visit us. If I can’t bore them by dragging them around to see it, they can watch it on their computers (I hope). When last winter was so cold and dreary, my husband made it my “wallpaper” on my computer, and as it scrolled through the pictures, it gave me hope that Spring would indeed come. Although a non-gardener, he’s installed it on his computer and enjoys it too! That is me-I picked dead leaves off the doctors plant and asked for a cup to water it. Thanks Mike. Mike, I loved it. I am old and in so much pain from many surgeries and implanted screws, wires, batteries, but I continue to garden in plastic tubs as I can’t bend over. I compost, keep red worms for vermicompost, and can never bear to see a seed and not stick it in the ground to watch it grow. I grow beautiful flowers, wonderful veggies and the sad thing is NO ONE IN MY FAMILY EATS GREENS EXCEPT ME. Oh, the shame of it all! Every time you trim a bush, you HAVE to use the cuttings to start new plants. You stop and pick up the black pots along the highway that have flown out of the back of other people’s trucks! Whenever you visit somebody and they have a plant you don’t have, you ask if you can take a cutting of it. Absolutely! Especially the hairwashing and grabbing at banana peels… okay, so most of the rest also. I so love Mike’s suggestions and comments. Most of it is true with me too.. Mike has converted me into a garden addict. I carry a pair of secateurs in my car to cut rare & exotic plant cuttings from the wayside. I’m from the other side of your world .. got linked to Mike .. I’m from India … Common factor Gardening !! OMG I thought I was the only one …..I creep around the garden on damp evenings with a torch and collect the snails and take them to safe place very far away from my garden…..every where I go I pinch slips and seeds….I lecture supermarkets about watering the plants and then buy the wilted ones cheaply and revive them….guess I’m gloriously addicted and woefully insane….would that all the world was thus….!!!! Thank you for the laugh and the Ah Ah moment !!! I certainly enjoyed the post, Mike , thank you for every e-mail. I’m another who answered “yes” to almost all of the questions, so I guess I am an addict, also. Those are very funny and oh, so true. I really enjoy all of your emails and videos. I have learned some useful and helpful info and tricks. Thanks for sharing your knowledge and humor. You’ve been spying on me! I never thin out anything I never throw away any plants I let anything that comes up voluntarily stay where it is but sometimes transplant it. I stop on the freeway if I spot big discarded empty plant containers. This last Fathers day my girlfriend bought me a shovel because that’s what I wanted. I love to fish and u know where the guts remains go. I don’t mind emptying the coffee machine every morning for the coffee grinds. I could go on and on yes I am an addict. Now I know, I’m a gardenoholic!!! You use plastic milk jugs with the bottoms cut out for hotcaps and you save those waxed milk and juice cartons to start plants in. You go to the back door of the natural foods store and haul away big boxes of veggie scraps to make compost piles. You always fall for some magazine article that promises it will tell you how to garden with ‘no work’. You’re surprised when all kinds of weeds you didn’t have before sprout up when you use that bagged manure even though it happened to you last year. Though I cannot say I relate to ‘everything’ on this list…I have known for years that my mind is always on gardening, no matter where I am and no matter what I’m doing I am thinking about what I can buy…do better…add to or remove from…clear out…clean out of…color coordinate…green up…de-slug…prune up…re-edge…mulch…fertilize…dead head…bird net…steak up…mow…weed…divide…move…water…spray…etc…in my landscape as well as most landscapes I see! It’s kind of scary actually but…what do you do? Mike..keep it going friend. Best laugh I’ve had all day… just came home with some salvaged plant material, a discarded plant label and a fist full of freshly picked cuttings, and I just was going for a walk before lunch! …when your “easy” chair is a lawn chair perched in the shade with a good view of the garden. This one made me tear-up a bit. I need a better chair! Thanks. I also like to stand on my back deck and see the shapes I create with my enclosed circles of chicken wire (love my chickens, but don’t want their doodie on my greens) with different plantings in them. The pathways are mulched, so I have a three-legged – thing with a long tail right now. Can’t wait to sit and stare at what it becomes! Oh, Mike? I used to jujurocks, but that e-mail is gone. I loved your newsletters, so you can add my new e-mail back on so I can enjoy your wonderful advice again. Thank you for all of the wonderful advice. YOU rock! You got me there all right, I am the lady with her robe and coffee cup and rubber clogs watering the garden in the morning LOL. Wow! I qualify on almost every count. Ah man, I thought I had an original idea by getting the dirt out from under my nails by washing my hair! You got me in the first one. Even though I am a beginner gardener I am getting there very fast. This was good. Thanks for the laugh. When in a last e-mail you talked about you and your son doing re-landscaping, i told my husband you been reading my mail!….since early spring I’ve been working clearing and cleaning an old goat pasture to be mowable expanding a side lawn. Mowable is all I will accomplish this spring. But thank you for giving me a name for it….re-landscaping. This addiction idea is real and I love it! You stop and knock on a complete stranger’s door and offer to trim their plants and bushes if you can keep the clippings!! You find yourself “deadheading” at Home Depot, Lowes and Wallmart. Hilarious! I love a good chuckle at myself. Even if it upsets my neighbor, I can’t stop myself from pulling the weed she is watering till it’s two feet tall! Thank you! I’m forwarding it to my sister. I was wondering if I was normal for asking for Garden Tools for Mother’s Day! Now I know that I’ve gone over the edge and am loving every minute of my gardening adventure. And, yes I am already planning my fall and next springs garden. Think I could slip that 7 ft. Japnese Maple by my husband…uh…maybe not – but it would be worth a try! Not 2 Hours ago I was thinking about sneaking home a japanese maple that I looked at this afternoon. It was a nice looking one about 7 feet. I need shade for all the Hostas I keep buying. Chickens produce some of the best compost one could ever hope for… I have trees that grew over a foot this month!!! Boy, I sure fit into that category. You wait 2 weeks to mow your lawn! Then add the huge dry pile of green clippings to your compost pile that rests behind your garage. Then hang out and watch the family of “Chipmunks” move in and cozy up by the warm pile as you relax with them and feed them peanuts as they dodge in and out! I mow every 4 or 5 days, sooner if it rains, from Spring until late Fall. My compost pile has grown from 3 feet by 6 feet, to well over 120 feet by 60 feet now! Every week I layer about 12 inches of leaves over the weeks grass clippings. I’ve got an abundance of leaves of many varieties as I live in the ‘Old Cross Black Forrest in Oklahoma, right off the lake! Terra Firma here is anywhere from 35 to 80 feet deep SAND! The resulting compost has allowed me to plant over two acres of Bermuda grass, and about 1/2 acre of great gardens all around the house and along the roads at my corner. Using a mix of natural occuring flowers with several ornamentals, Hydrangea, Euonomous, Daffodil, Perywinkle, and HUNDREDS of Marygold in three varieties. As a result, every spring we get butterflies gallore….Painted Lady, Monarch, and many others! So far, our dog has kept the deer, fox, Armadillo, skunks, rabbit, possums, beavers, and other dogs out, but still have problems with moles, Pigmy Rattlers, Copperheads, Cottonmouth, and squirrels. Was reading your comment and saw the bit about the butterflies. I would guess you would have plenty of Swan plants for them too. The monarchs here in New Zealand use the Swan plant as places to lay their eggs and raise their young to Chrysalis stage then they hook onto the underneath of the verandah or the side of the fence till they become butterflies. Gorgeous to watch!! Bless you all. Lovely reading your comments on the other side of the equator!! I love your letter every week and you give me new idea every time keep them going and I think I’m a gardening addict also. You know you are OCD when you know when each lily blooms and how long it stays. But at least I know that the “bugs” on the tiger lilies are just seed pods! It’s interesting to know that Stacey Wright thinks you are God! We plant trees but only God can make a tree. Stacey opening your comment with the name of God is not a good use of God’s name. Think about it. With love a fellow gardener. Robert, let’s not get so critical here! Yep Robert, make sure you lecture or cut down every person who has a different belief system as you. If a person wishes to bring God’s attention to this wonderfully funny blog post then that is her choice. It’s called freedom of speech & religion. And I’m sure if God exists that he appreciates that people have those freedoms. I thought, you mean there are others ? I am sane after all ! I love my e-mails from Mike. Thank you, Mike. Helpful and funny. Can I use it on my gardening blog if I credit you? Nicki, it wasn’t mine to begin with but if you want to mention me on your blog you are more than welcome to do so. You should consider becoming an affiliate if you post to your blog regularly. The questionaire is so true! I also answered yes to most & don’t understand people who can’t see this! LOL I also go to Home Depot or Lowes & straighted up their plants & put seed packets in the right places. How true! If my husband gave me a chipper/shredder – a nice big one – for my anniversary, I’d love him forever. I was in a class (something about gardening of course) and someone said something about her new lopers and how great they worked. We all went – ah, really, what brand, etc. etc. My daughter was with me when I started to back up the truck to collect the bagged leaves someone had left on the curb and she commented about how embarassing it is to ride with me. But my grandsons have learned how to collect seed pods from trumpet vine and desert willow, along with other plants that are in various commercial property parking lots. They know where the paper bags are and remind me to label and date the bags. Gardening addicts in training! I always wondered what was wrong with me………… so I am a gardening addict………….. somebody know a rehab somewhere? Your back yard is your rehab and it’s free. Very funny and oh, so true! Thanks for a great laugh! Dianne and others, if you are on my mailing list you probably can answer yes to most of them. I sure can! GOD I HAD TO LAUGH! I ANSWERED YES TO MOST ALL OF THEM! I pull weeds wherever I am, too. I do the same thing Lisa. I cant help it, they dont belong there. I also pick up trash and recycle. Well, I do it too. OCD is good for some things, like a weed-free garden…LOL. LMAO! I hate to admit it but I’ve actually cleaned my nails while washing my hair!! It works!! I prune trees in parks. I always have my branch nippers and hand nippers in my Mustang! And I too, can’t resist a weed! I’ve spent 4 hours pulling weeds in a 20ft X 20ft area. It’s refreshing to have such a passion about something again I tell ya!